On The Go: How Mobile is Agents of Storm? On The Go is a new feature which tests Remedy products on the go; seeing how perfect they are for your commute to work, while travelling on holiday, or returning home for Christmas. This could be mobile games or books, anything small enough to be part of a regular journey. Today we're looking at Remedy's latest mobile game, Agents of Storm. After the release of Alan Wake, Remedy divided itself into two groups; one team worked on "the next big thing", whereas the second group focused on the mobile space. This was shortly after the Rovio unleashed their Angry Bird franchise, and just before Supercell found gold with their Clash of Clans. The incredible popularity and financial success not only proved to the industry that the mobile space was a platform where even smaller companies could strike rich but with both mobile game giants being based in Finland, a huge focus was on retreading the walk of success, especially within the country. And so Remedy rededicated half of its company to mobile games. Two games were developed and published within a three year window, and while it wasn't officially announced that Remedy was departing from the two team structure, the developers stopped hiring specifically for mobile developers around 2015. The first game that was released with the new team was Death Rally, developed by Mountain Sheep in collaboration with Remedy, which was released on Android and iOS in 2011 and PC in 2012. The second game is the one we're going to be talking about today, Agents of Storm. 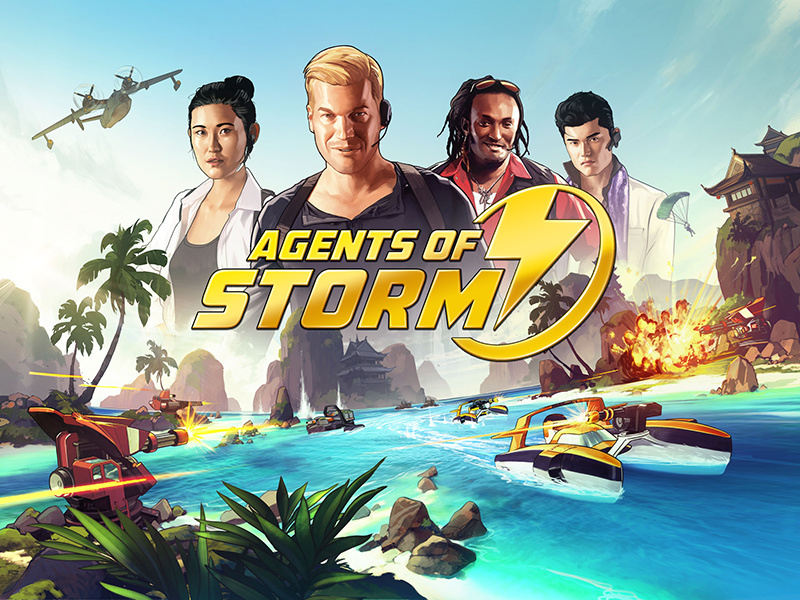 Agents of Storm was announced during VGX (The Spike Video Game Awards) on 8th December 2013, and was published that following October by Flaregames. An Android and Windows Phone version had been announced at the time of release on Apple devices but seemingly cancelled, although no official announcement has been made. 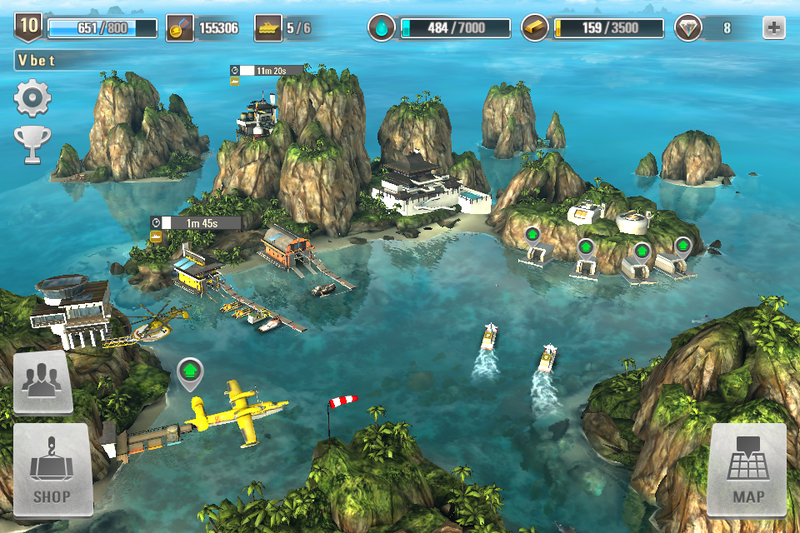 Agents of Storm is a 3D strategy game taking place on the high seas. You control and build a base, expand your army and lead your agents in an intense battle against the Chimera corporation. On your travels you will find resources such as Gold and Jade, both of which can be used to build structures and make improvements. The level task is clear, get from point A to B.... but it's a little more complex than that. In actuality, you plan a strategy for making your boats sail from A to B thorough a labyrinth of automatic turrets, reaping containers of Jade from storage units, and taking on a Chimera base in a final all-out fight. Mini levels are spread around the map too. During these detours, you may be chasing a conveyer containing blueprints which are vital for researching structure or vehicle upgrades. There are also slightly tougher boss battles in which your ships face more turrets and other defences but are rewarded with more lucrative prizes. Next we have the missions screen. The screen reveals the location of the enemy bases and what order you need to attack them in. Similar to your base, the area is 3D too but it's more limited on how much you can explain. It does allow you to zoom in and out though, and if you go too far up the area becomes bordered with clouds, which is another nice touch! For some of the levels there's some dialogue before the action begins; while the overarching plot is a straight forward good corporation verses evil corporation scenario, the dialogue, filled with fun quips and genuine chemistry between the storm agents, adds to the gameplay experience. Finally there is the base attacks, and at the start it may seem fairly easy. 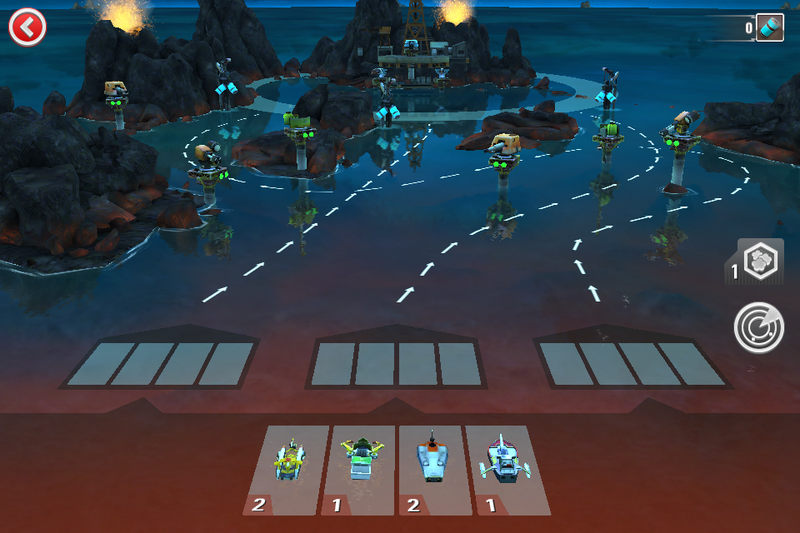 You're given a base to attack, a path to take and a limit of boats you can have on each path. But while it may seem simple at first, things like acid guns, improved turrets, and minefields can make your paths that little less ordinary. With them, you now can no longer blast your way through bases, instead you need to plan when to use your smoke bombs. Do you use it on that tricky turret in the middle that will destroy half of your fleet or at the boss battle? The game and dialogue sections do a good job at warning and informing you on which specific boats are needed in a particular level. It's not heavy handed with it, so you still have to pay attention! Sometimes you get word that surveillance has picked up a minefield in the next section, or that there's rumours of a new weapon type coming soon which makes armour upgrades to your fleet a top importance. Which is a really good thing! I've played games before in which I've levelled up and upgraded items only to realise the level I was entered wanted something different. As plans for an Android and Windows Phone version fell through, the only way to really play the title is if you have access to an iPad or iPhone. Which unfortunately does limit the audience to a specific mobile device type. On the plus side, the game is F2F (Free to Play) allowing gamers who have a iPad/iPhone to test to see if they like it before making a heavier time investment. Players can invest actual money into the game by purchasing diamonds, but you can also watch an advert (roughly thirty seconds) to receive a single diamond or claim a tiny bundle from completing challenges or missions. Diamonds are used as the main soft money which can be used to purchase an array of different resources such as additional Gold, Jade, and blueprints. They can also be used to speed up construction of upgrades or buildings. Agents of Storm feels targeted at both players who want to play a game for a minute or two and the players who want to be engaged for longer. 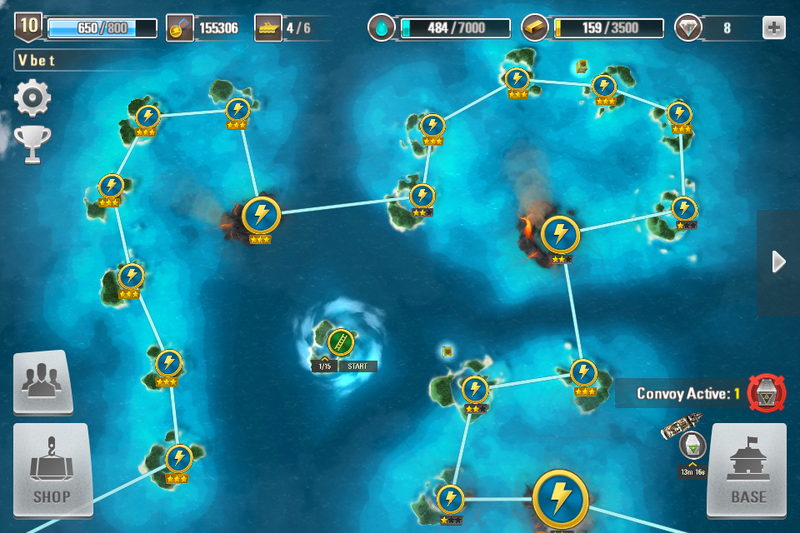 At the start, your base already has a decent amount of diamonds to get you going, and a series of easy battles allows you to build up your resources. That doesn't mean that the game is easy though, once Chimera starts upgrading their weapons and armour, it demands a little more planning. During this time, and depending on how quickly you burned through your gold, you may need to wait for your agents to return from missions or your Gold Gatherers (cargo ships) to return. And like most strategy games unless you're paying for diamonds to speed up construction, waiting will be more common the more you play. Given the game's aesthetic, it feels very fitting for a plane journey to a holiday destination... just as long as there's not a ferry afterwards.